Samantha Akkineni is busy with the promotions of her upcoming films, Mahanati and Irumbu Thirai, which are slated to be released on May 9th and May 11th respectively. Samantha Akkineni and husband Naga Chaitanya are the cutest couple in Tollywood and fans of the stars are always in awe of their PDA. Right from their engagement in February last year till the wedding in October, the star couple have often posted cute pics on social media which has always left fans fall in love with them and asking for more. And as recently as yesterday, it happened again! 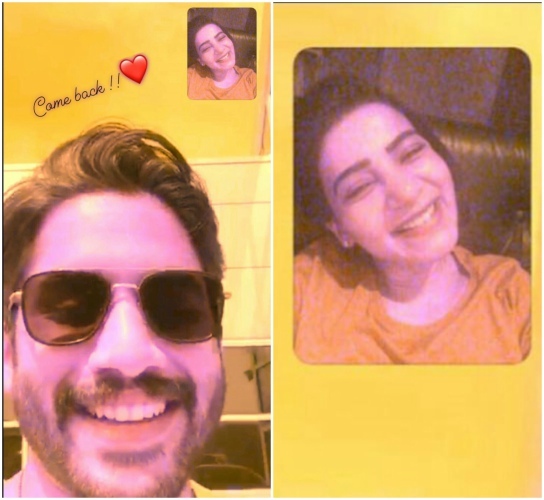 Samantha Akkineni posted a picture on her Instagram as a story from their video call. Samantha Akkineni is busy with the promotions of her two films – Mahanati and Irumbu Thirai – while Naga Chaitanya is shooting for his upcoming film Savyasachi in the US. Sam seems to be missing Chay very badly and posted this picture captioning it “Come Back!“. Their PDA surely cannot be missed! Samantha Akkineni is busy with the promotions of her upcoming films, Mahanati and Irumbu Thirai, which are slated to be released on May 9th and May 11th respectively. Samantha has been shuttling between Hyderabad and Chennai for the promotions of both the films. Mahanati will have Samantha playing a journo and will be the narrator of the story of the life of Savitri, on who the biopic is made. Mahanati is directed by Nag Ashwin and stars Keerthy Suresh and Dulquer Salmaan in central roles. Akkineni Naga Chaitanya is shooting in the US for his upcoming film Savyasachi which is being directed by Chandoo Mondeti. Savyasachi also stars Nidhi Agrewal who will be making her debut in Tollywood with this film. Besides Chay and Nidhi, Savyasachi also stars Tamil actor R.Madhavan and Bhumika Chawla in important roles who have already shot for their portions in the film. Savyasachi is being produced by Mythri Movie Makers who have produced hit films like Rangasthalam, Srimanthudu and Mirchi. They don’t have phones I think!